but somebody's gotta do it! 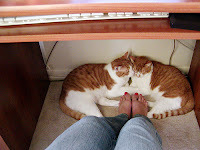 My kitties like to keep me company (and keep my feet warm!) while I edit sessions on the computer. The best part? They work for treats.